The Summit League and Mid-Eastern Athletic Conference champions clash Wednesday when North Dakota State plays North Carolina Central in an East Regional play-in game in Dayton, Ohio. Tipoff is at 6:40 p.m. ET from the University of Dayton Arena. The Bison (18-15) are making their first NCAA Tournament appearance since 2015, while the Eagles (18-15) are in the Big Dance for the third straight year. Whoever wins gets the daunting task of facing No. 1 overall seed Duke on Friday in Columbia, S.C. Bookmakers peg the Bison as 5-point favorites, with the over-under for total points set at 134 in the latest North Carolina Central vs. North Dakota State odds. Before you make any North Carolina Central vs. North Dakota State picks and NCAA Tournament First Four predictions, see what SportsLine expert Michael "The Prodigy" Rusk has to say. Rusk built his name by exploiting flaws in public betting. With his economics and statistics background, Rusk uses multiple algorithms pooling with recency bias to produce profitable picks. That's exactly what "The Prodigy" has been doing recently with his strong 30-18 run in college basketball. Now, Rusk has dialed in on NC Central vs. North Dakota State. We can tell you he's leaning over, but his much stronger play is against the spread. He's only sharing his pick at SportsLine. Rusk knows the Bison are a potentially lethal offensive team that ranks 71st nationally in 3-point percentage and 17th in free-throw shooting percentage. They shoot the 10th-most treys in the nation, model themselves after the Golden State Warriors and can beat almost anyone if they're in rhythm. Eight players average at least 6.0 points, with Vinnie Shahid (12.8 ppg) and Tyson Ward (12.3 ppg, 6.3 rpg) leading the way. Shahid was dynamic in the Summit League final, posting 22 points and three assists in a 73-63 win over Omaha. That was North Dakota State's fourth straight victory. But just because the Bison are hot and can light up the scoreboard from deep doesn't mean they'll cover the North Carolina Central vs. North Dakota State spread on Wednesday. NC Central is making its fourth Big Dance appearance ever, and this is its third straight year as a 16-seed playing in Dayton. Unlike the Bison, the Eagles are extremely familiar with the arena. Senior Raasean Davis will be a handful Wednesday night. He averages 14.6 points and 8.9 rebounds while shooting an eye-popping 64.5 percent from the floor. He's the biggest reason why NC Central ripped off three straight wins in the conference tournament and has won eight of its last 10 overall. In that stretch, the Eagles have gone 7-1-2 against the spread. Rusk has identified a critical difference between these teams that has him going big on one side of the spread. You absolutely need to see his pick before locking in any of your own. Who wins NC Central vs. North Dakota State? And what critical difference makes one side of the spread a must-back? 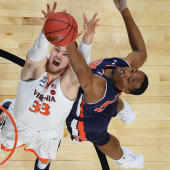 Visit SportsLine now to see Michael Rusk's strong pointspread pick, all from "The Prodigy" who's on a sizzling 30-18 college basketball run.